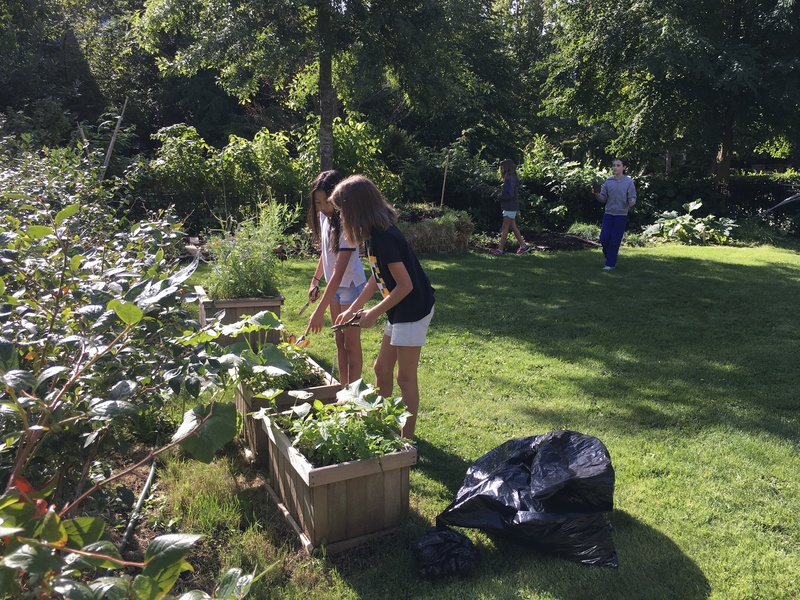 How to Volunteer in the UNA Childrens ​Garden? Volunteers in the garden help to maintain the garden. The garden welcomes all skill and enthusiam levels. 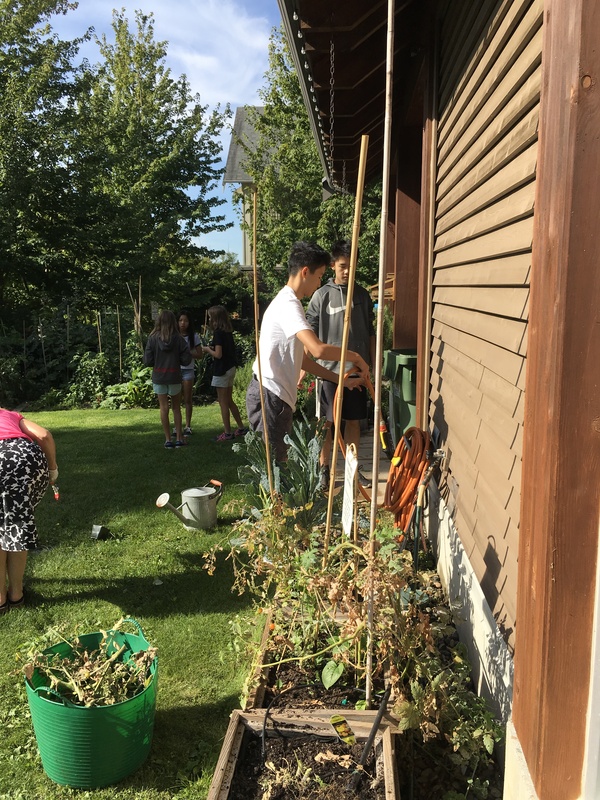 Volunteers in the garden participate in a wide range of activities. The youth volunteers are helping the children learn about fertilizing strawberry plants to increase crop yield. Youth volunteers learn about the three ways to maintain the shape and form of apple trees. The first volunteer planning session occured this past Saturday. Volunteers are working on making signs for the garden, organizing the garden shed and making a butterfly and hummingbird garden. Spring Gardening time means soil preparation time and many opportunities to particpate in your community. Mulch was added to the garden beds to protect the soil from moisture loss and to prevent weeds from growing. Mulch waiting to be spread onto the garden beds in the garden. The red currants have flowered along the fruiting spurs. The blueberry plants have started to flower. Blueberry plants prefer slightly acidic soil and lots of moisture to produce a good crop of fruit. Local children volunteers will pick and sell the berries in early summer. Stay tuned for Crop Watch. The soil in the containers has been refreshed by having the depleted soil removed and having new soil and mulch added. These containers have been planted with parsley and radish seeds. Coffee grounds from the local coffee shop is donated to the Children’s garden. The grounds are spread under the blueberry plants during the growing season. The coffee grounds make an ideal top dressing for the plants. Apple Picking Time at the Children’s Garden. 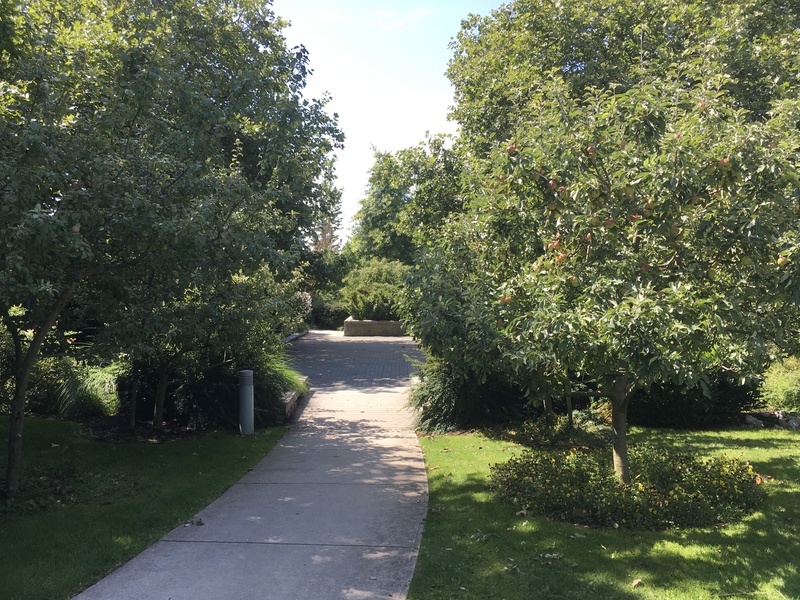 The Children’s Garden has over a dozen fruit trees, mostly apples. The apples are ripe and ready for picking. 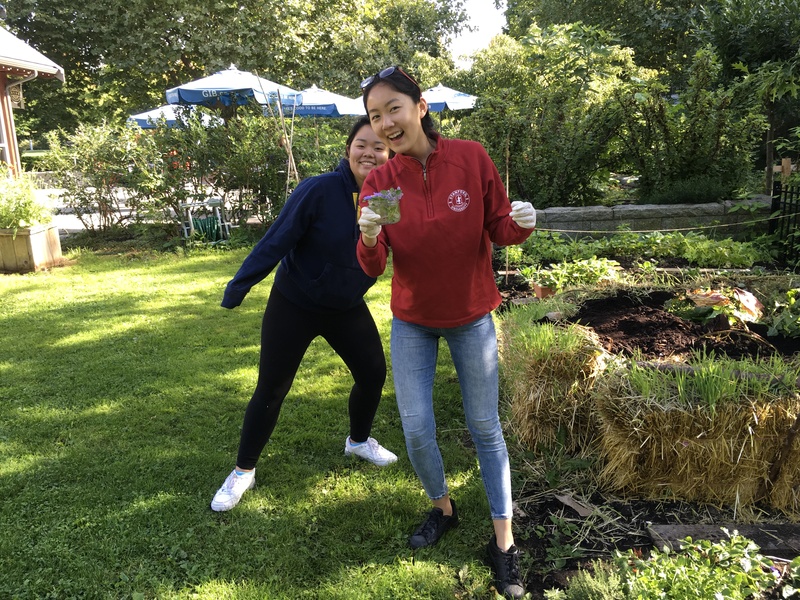 Please join the garden volunteers next Saturday, October 6, 2018, at 10:00 am to help with the harvest. The youth volunteers picked the late fall ripening apples on Saturday. The Children’s Garden has received several significant donations of fruit trees this past year. 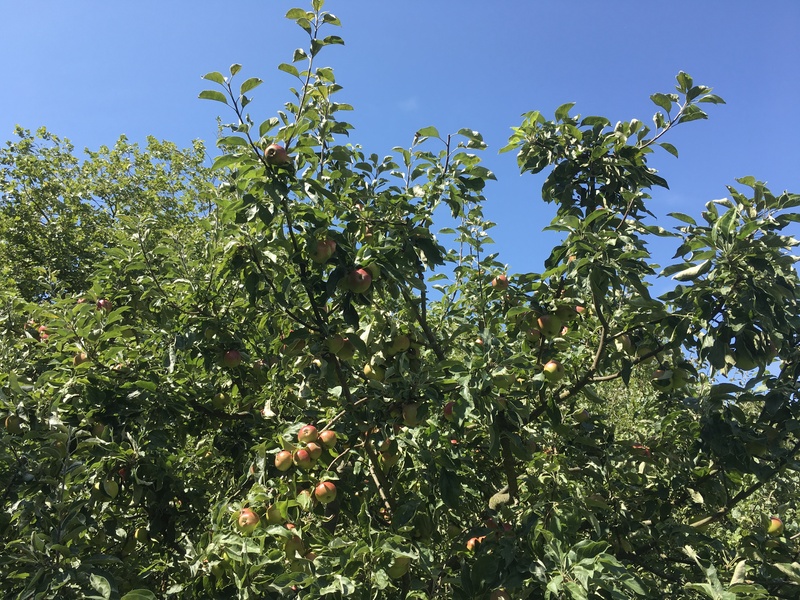 We are looking forward to renewing the apple orchard with the 2018 fruit tree donations. 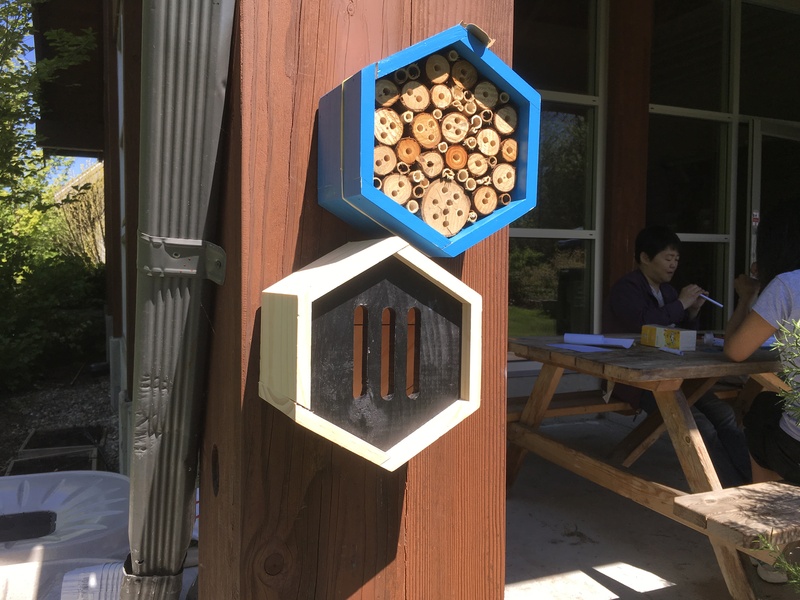 A Critter hotel – learn more about how to create a suitable habitat for garden creatures (bugs, snakes etc). Come and learn how to design and build critter habitats using a variety of material. A variety of bug habitats made with found garden debris. 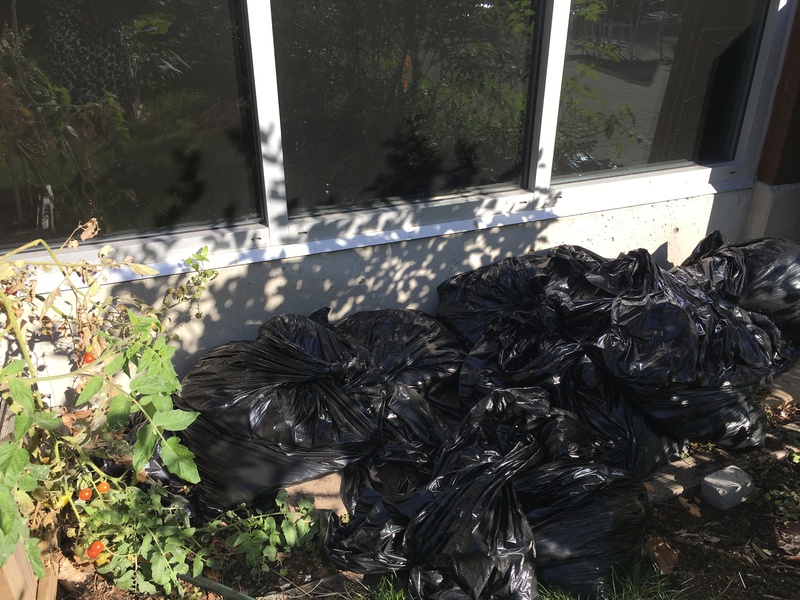 A Free workshop on building critter and bug winter habitats is being organized for Saturday, September 29, 2018, at 10:00 am on the Garden Patio, next to the Old Barn Community Centre. The patio planters are showing their age and are in need of being refurbished. The old wood from the planters will be repurposed into suitable winter housing for some of the garden critters such as sow bugs, ants, and millipedes. This is a free event. Registration is not required. Hope to see you there. 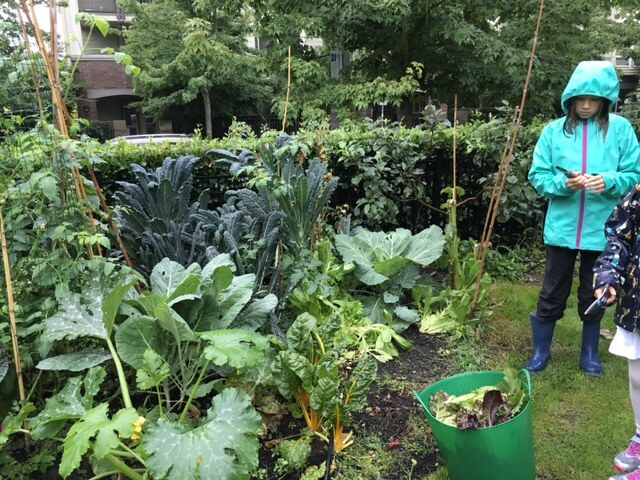 Community gardening every Saturday morning. Coffe grounds from the Old Barn Coffee Shop, Beans Around the World, are set aside every day for use in the garden. The grounds are used as a mulch. Basil is growing well. 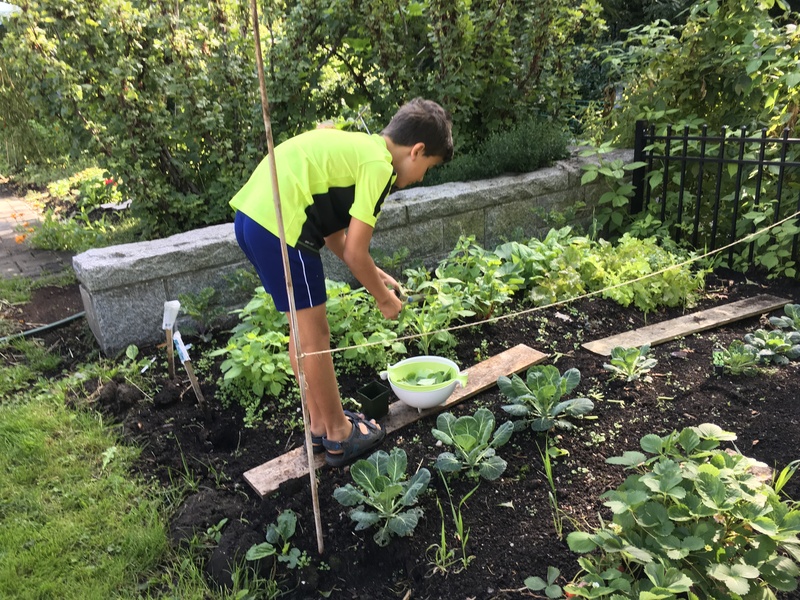 A young volunteer harvests the basil. Basil is picked and washed for the Saturday am sale. A weeks worth of coffee grounds was spread in the middle of the straw bales. This brown layer will then be covered with a green layer of garden weeds etc. This week the straw bales garden had a brown layer of coffee added to the middle. straw bales make excellent planting spaces. The bales are above the ground. This makes it difficult for slugs 🐌 to find the seedlings. 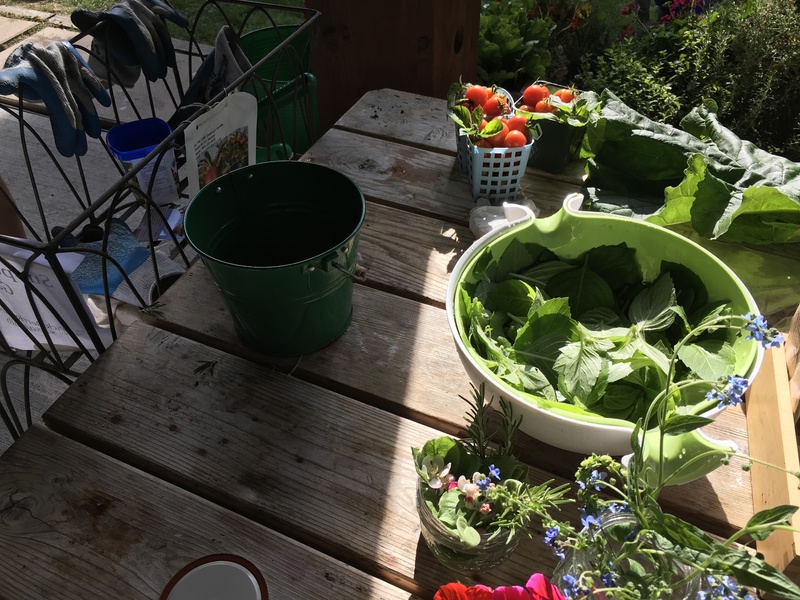 The garden has many young volunteers who have worked all season long to produce a fantastic crop of garden vegetables. Garden volunteers monitor the growth of the crops in the planter boxes. Older volunteers help the younger volunteers with the garden hoses. Tubs of cheery tomatoes were harvested and sold at the Saturday morning produce sale. 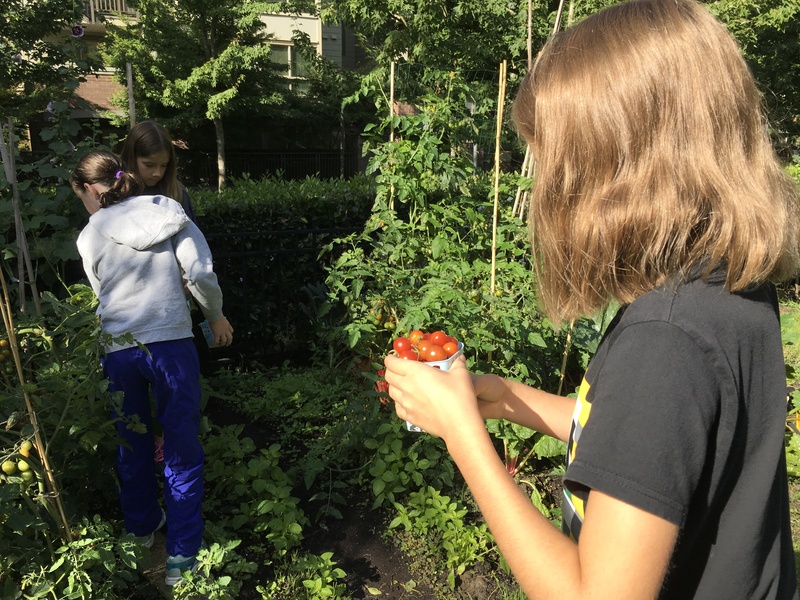 Garden volunteers pick the tomatoes for a produce sale. Thank you to the wonderful volunteers who help sustain community gardening. First Rainy Saturday in over 8 weeks does not dampen the enthusiasm of the garden volunteers. 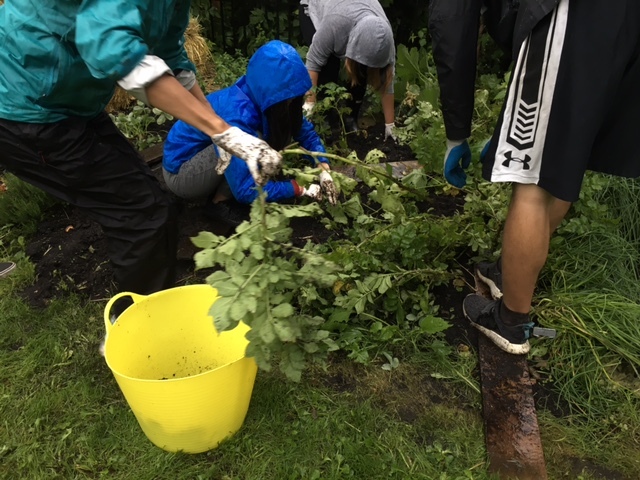 Last Saturday, in spite of the heavy rain, volunteers worked enthusiastically and harvested potatoes. Garden volunteers worked in the rain this past Saturday and harvested the final crop late season potatoes. 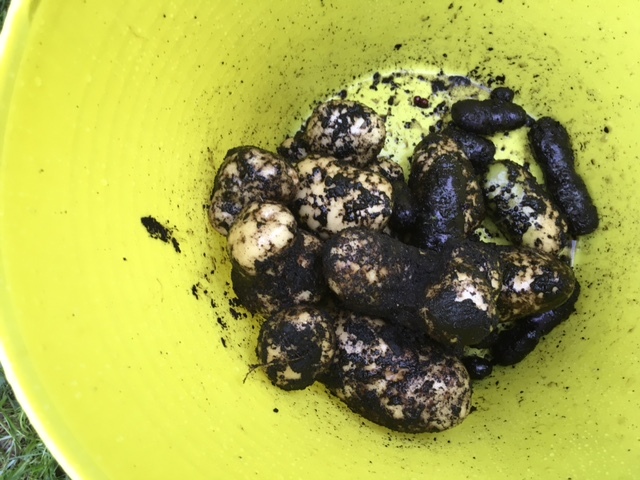 Three varieties of potatoes were harvested carefully by hand. The kale and collards have produced a bountiful crop. 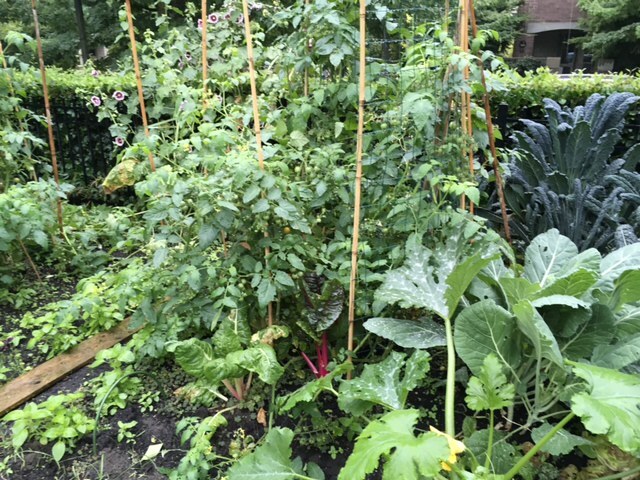 The tomatoes are doing beautifully in the garden. Every year over a half dozen of tomatoe plants will grow from seed. 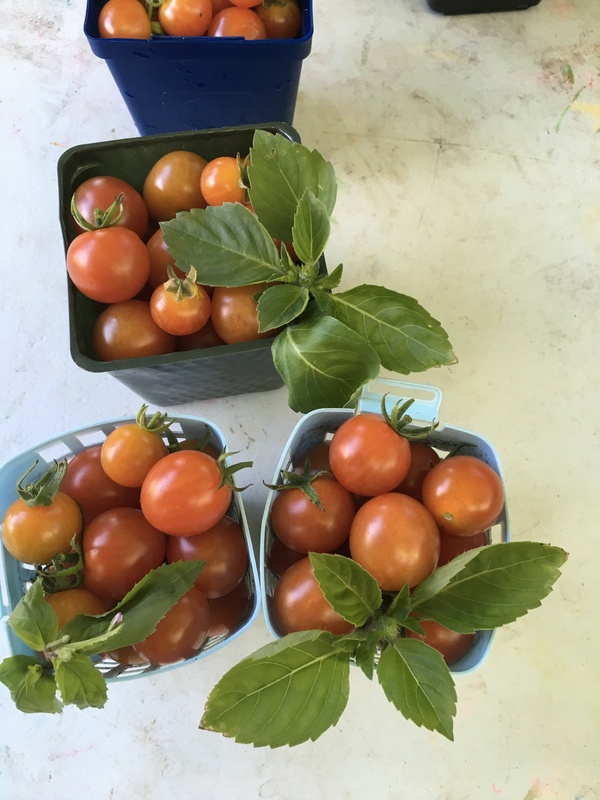 These volunteers plants produce an abundant crop and are blight resistant. Straw bales make a unique medium for growing plants. Straw is seed and insect free. Young seedlings are able to grow without being eaten by bugs. The straw is arranged in a square. The height of the bales makes it easy to plant directly into the straw. Thanks to all the hard work of the garden volunteers. Straw bales make a special growing medium. By re-using organic material for growing food we can increase our sustainable growing practices. Straw bales make a unique growing medium. Straw is weed and seed free. Straw has very few insects living in it. Therefore, straw bales makes an ideal growing medium. 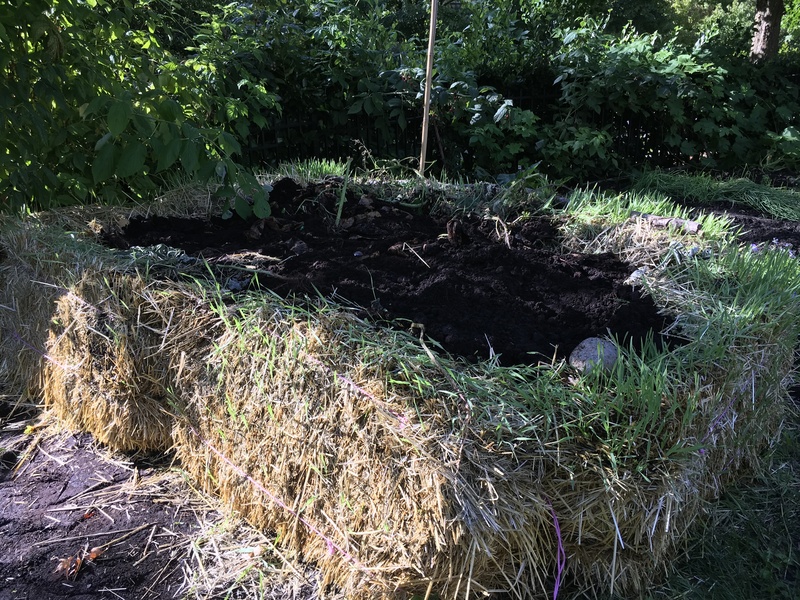 This fall the Children’s garden volunteers have created a straw bale garden for the fall and winter growing season. The first step in creating a straw bale garden is sourcing and stacking the bales of straw. The straw bales from the Old Barn Community Centre’s “Barn Raising Celebration” were donated to the Children’s Garden. The industrious and hardworking garden volunteers worked hard to gather the straw and stack it into a garden bed. Keep posted to learn more about conditioning the straw for growing. The early apples are ready to be picked. A small selection of apples were sold at the Saturday morning produce sale. Early summer eating apples do not store well. 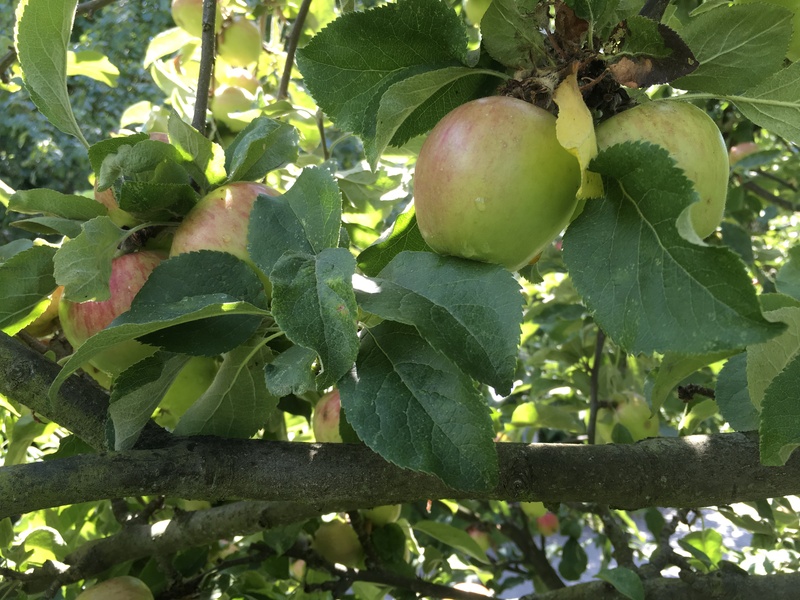 Early varieties are excellent eating apples. The apples are not to tart but nice and crisp. There are 3 different varieties of apples growing in the Children’s garden. The earliest ripening variety produces a big crop of mid -sized eating apples. The two apple trees on the South side of the path are being shaded out by conifers. 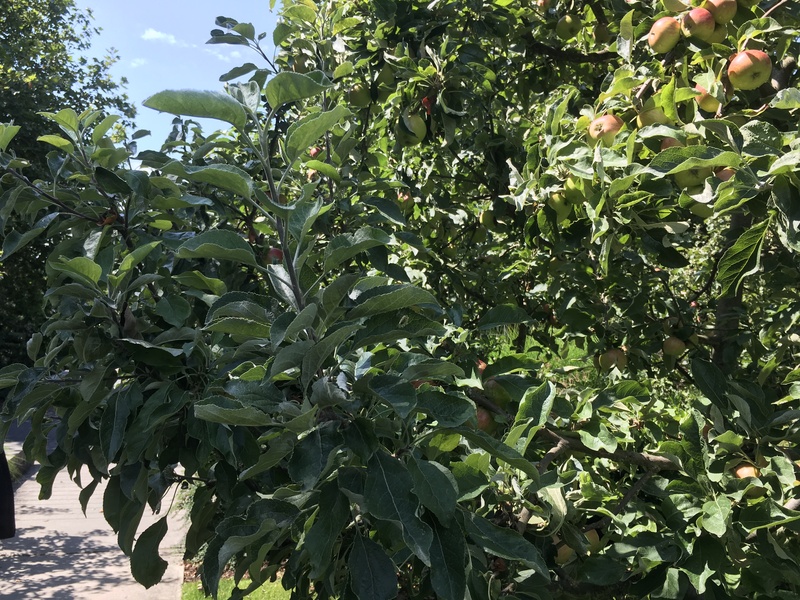 These trees produce a relatively small crop of apples.